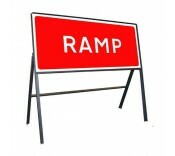 Our temporary road signs are manufactured to Chapter 8, complying with BS 8442. 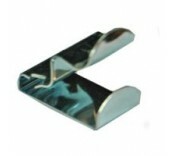 This particular standard states that all signs should be constructed in such a way that the lowest edge of the sign, or any of the supplementary plate, should be no less than 300mm from the surface. The temporary signs should also be constructed that when erected the sign face is either normal to the supporting surface or inclined so that the top of the sign leans away at angle no greater than 22 degrees. All our temporary road comply to this standard. The plates are made from 20 guage zintec and the frames from angle-iron. We normally rivet the plates and frames together unless we are told to clip them. Our temporary road signs can be erected at the side of or above roads to give instructions or provide information to road users. 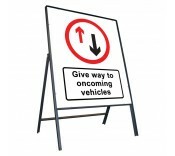 They are easy to set up, take down, and conform to all necessary road safety specifications. All of our signs have rounded corners to make them safer for anyone who comes into contact with them. 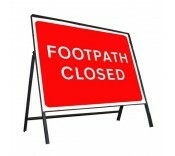 It also makes the signs more durable, as rain is less likely to corrode the corners. They also contain zintec reflective plates, to make them as visible as possible for oncoming drivers and road users. 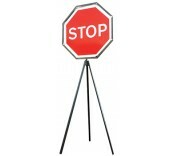 We have managed our temporary road signs into different size categories. 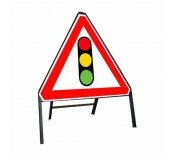 Usually bigger signs are more suitable when cars are moving faster on the road they are being used on, as it gives drivers more time to react from when they see a big sign rather than a small one. 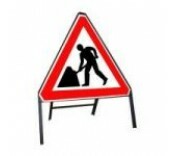 • Warning signs, such as; roadworks, traffic signals, two way traffic, uneven road, loose chippings, flood, & other danger signs. • Regulatory signs, such as; no left/right turn, no entry, & keep left/right signs. 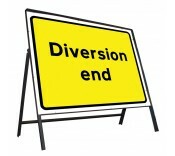 • Diversion and roadworks signs, such as; 'Diversion End', 'Road Closed', & 'When Red Light Shows Wait Here' signs. 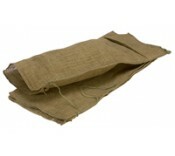 We also have sandbags in this section that can be used to provide defense against flooding, and road sign posts & clips. In the road sign posts & clips section you will also find; banding tools, stainless steel banding tape, universal channel clamps, banding straps, fixing channels, & sign masking spray paint.